Well-regarded in the industry for high, reliable gene expression, SBI’s lentiviral vectors also efficiently deliver RNAi. Generate cell lines with stable, heritable gene silencing to develop a thorough understand of the target gene’s function. Our HIV-based pSIH1-H1-Puro shRNA Cloning and Expression Lentivector drives expression of your shRNA template from the H1 promoter, and includes a puromycin marker driven by the strong CMV promoter for selection. After processing in the cell, your shRNA will be converted into siRNA. To produce siRNAs for RNAi using the pSIF1-H1-copGFP Cloning and Expression Lentivector, first clone your shRNA template into the unique BamHI or EcoRI sites in the vector. After packaging and transduction, the vector will integrate into the genome and your shRNA will be transcribed from the H1 promoter using RNA polymerase III. The shRNA is transcribed as a single strand with a sense-loop-anti-sense structure that folds into a hairpin, and is then processed by DICER to produce an active siRNA molecule (Figure 1). Figure 1. 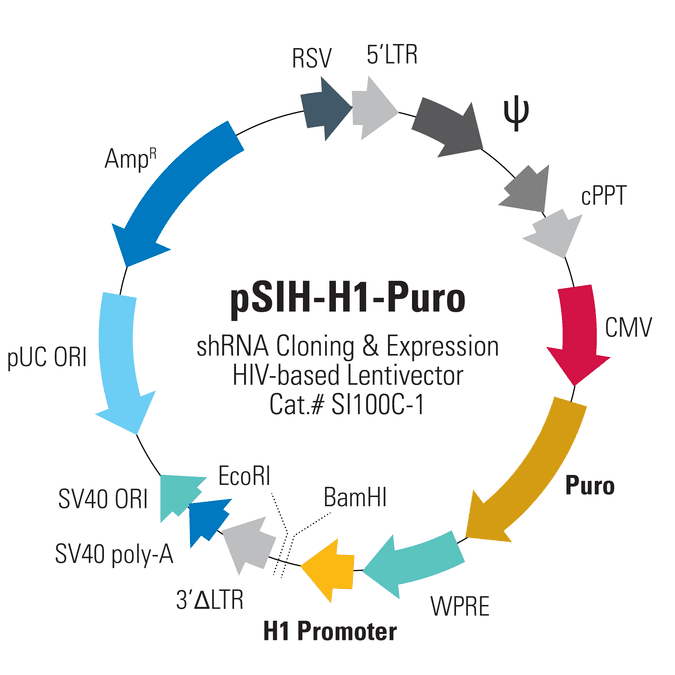 Generating siRNA from the pSIH1-H1-Puro Cloning and Expression Lentivector. Figure 2. Using SBI’s shRNA lentivectors. Easily select transductants with one of our markers—these examples show selection using GFP and puromycin markers on either the pSIH1-H1-copGFP (Cat.# SI501B-1) or pGreenPuro™ (Cat.# SI505A-1VB-1) shRNA Cloning and Expression Lentivectors.